All cupcakes are made with the finest ingredients. Every batter, filling, and frosting is made from scratch!! 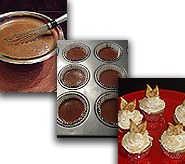 *Most gourmet cupcake flavors are available to order as mini-cupcakes. Perfect for any occasion where you want to impress your family or guests. Ideal for weddings, showers, birthdays, and holidays. Custom made, single tier, multi-layer cakes, created specifically for any celebration. Want something one of a kind? Choose your own batter, filling, and frosting!! Minimum order of 12 cupcakes (same flavor). $2 per cupcake. Indicate the desired delivery day and time. Available delivery days are Tuesday, Thursday, Friday or Saturday. Available delivery times are 9:00-11:00am, noon-4:00pm or 5:00-9:00pm. If you send your order via email, please include your name, phone number, home address and delivery address (if delivery location is not your home). Delivery charges apply. The delivery charge is based on total miles driven. Please phone or email for details. Note: Local Cleveland area delivery only. For cupcake orders, please order at least 2 days in advance. For cake orders, please order at least 1 week in advance.